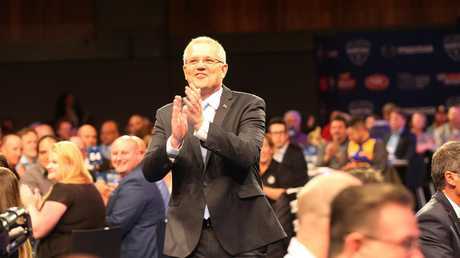 RUGBY League tragic Prime Minister Scott Morrison said he felt like an "atheist turning up at the Pearly Gates" as he fronted Saturday morning's North Melbourne Grand Final Breakfast. Owning his lack of AFL knowledge, Morrison said: "It is true, I do come from north of the Barassi line and as the No.1 1 ticket holder of an NRL club I do feel a bit like an atheist turning up at the Pearly Gates." 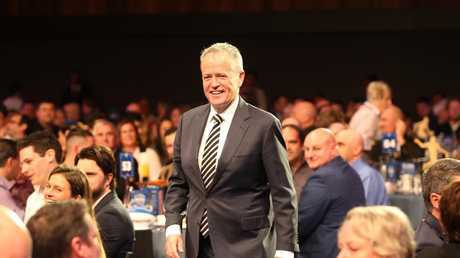 His political rival, Opposition Leader Bill Shorten, revealed how his Collingwood roots shaped him, telling the room he worked as a ground attendant at the Pie's spiritual home, Victoria Park, during his university days. 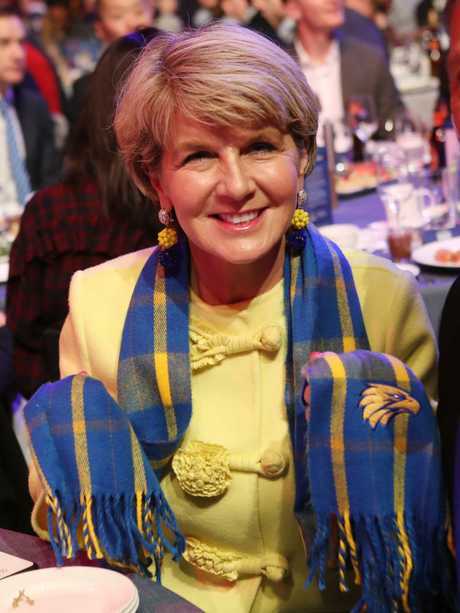 Shorten was a blue coat attendant in the players' tunnel, a role described as the last line of defence between the players, supporters and police in the rough and tumble days of league footy. "I was involved in a modest way in Collingwood's famous 1990 premiership," he said. "I was working part-time at Victoria Park as a ground attendant; a blue coat. "For a Collingwood supporter that was a great gig; penalty rates at the weekend, discount beers at the social club. "Most of the time you just sat there doing nothing, listening to people shouting abuse. Bit like parliament, really. "Of course, Pies fans are a passionate bunch so you had to soak up a fair bit of their encouragement. "And when I say soak up I mean it literally. Not for nothing did we wear raincoats." Shorten, wearing a black and white tie to show his Magpie colours, was among a flock of politicians attending the annual breakfast including Deputy PM Michael McCormack, Mathias Cormann, Julie Bishop and Josh Frydenberg. Morrison maintained a good humoured grin throughout, despite the expected ribbing about the revolving-door state of the Australian prime ministership. As noted by comedian Tommy Little: "Mathias Cormann is here or as I like to call him next week's prime minister." Morrison was introduced to the room by the voice-over as the man who leads a party where "leadership challenges are a necessary evil" with the Elton John song I'm Still Standing playing. Even North Melbourne chairman Ben Buckley gave him a gentle chip, encouraging a "warm North Melbourne welcome to our newest Prime Minister." Shorten, was introduced to the room via the Queen song I Want It All. Collingwood president Eddie McGuire's legendary enthusiasm for his beloved Magpies was singled out as a cause for concern by AFL boss Gillon McLachlan. McLachlan said he was living in fear at what sort of emotional reaction McGuire might have should Collingwood be victorious, after he received a passionate smooch from the Magpie president following the club's preliminary final victory. 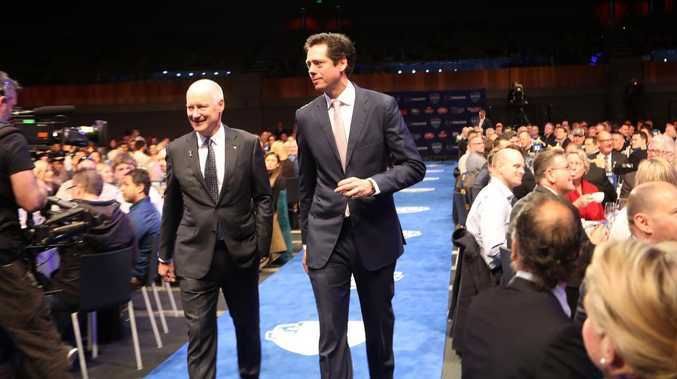 "I have lived in terror ever since, lying awake just wondering what would happen if Collingwood won the premiership, wondering what it could mean for me," McLachlan said. "I used to think Eddie approaching me after a loss was the most terrifying scenario, now I am not too sure." Other guests at the annual breakfast included Bob Ansett, Anthony Stevens, Brent Harvey, Dermott Brereton, Bianca Chatfield, Neil Mitchell, Joseph Deng, Lydia Lassila, Allen Aylett and David Koch.